In a blink of an eye, the first quarter of 2018 has come to an end. Everyday 忙忙碌碌 until March so I have decided to do a recap instead. We have been taking things slow and easy since the beginning of the year and now our kids are starting their engine gradually and working hard towards their goals. 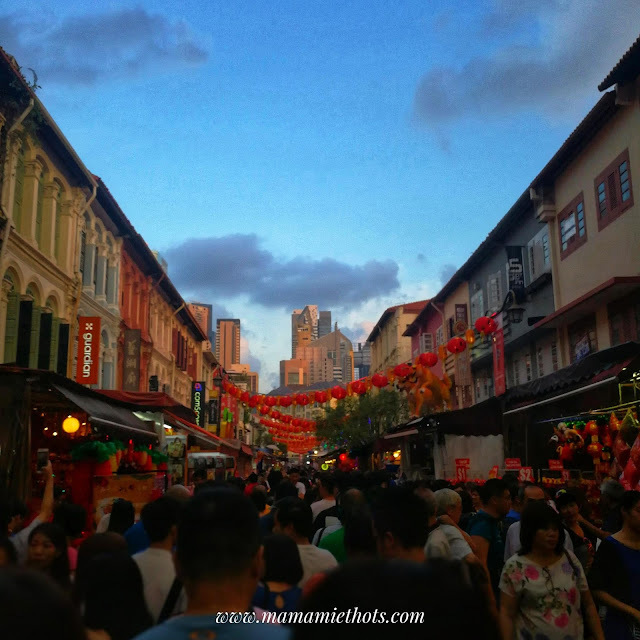 Our annual visit to Chinatown to check out Chinese New Year stuff. This year, we went in and out of the place within 15 minutes, the fastest record so far! Lo-hei tradition is a must during Chinese New Year! 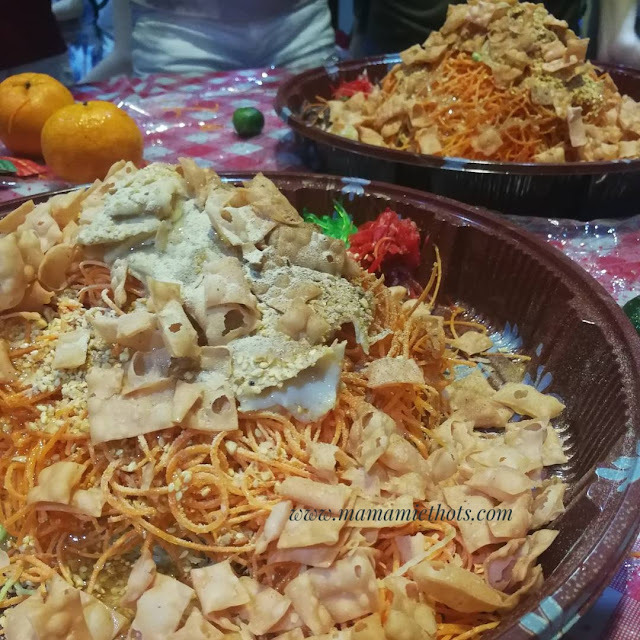 Every year, everyone will gather around the big round table to lo-hei together for good luck, prosperity and good health! As for me, I prefer to be the person behind the lens to capture the live action. Recently, little bro-in-law bought a very cute puppy named Chewie and the kids had so much fun with this furry animal. Believe it or not, that was their very first close encounter with a puppy too. The girl brought back a small tube of henna dye from the school one day and asked me to draw on her hand. 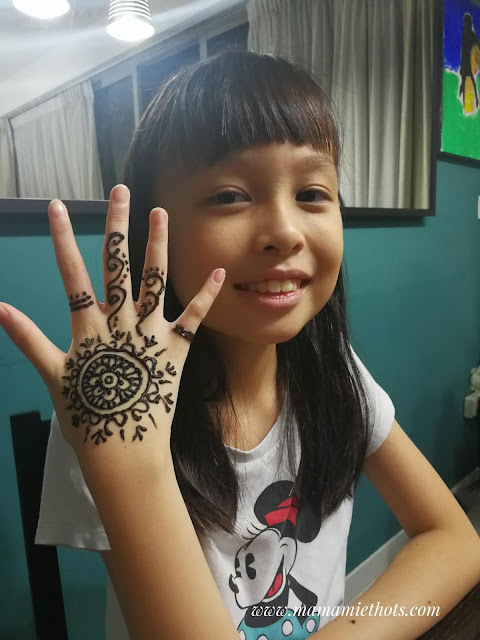 Thanks to Google, I managed to copy a simple design and my first henna artwork on her hand looked pretty decent, isn't it? Ever since the eldest started school, he has been coping pretty well in the new environment. We love the strong camaraderie of this school too. No doubt there are more school work, projects and assignments to tackle now, we can sense our boy is getting more serious in his studies. 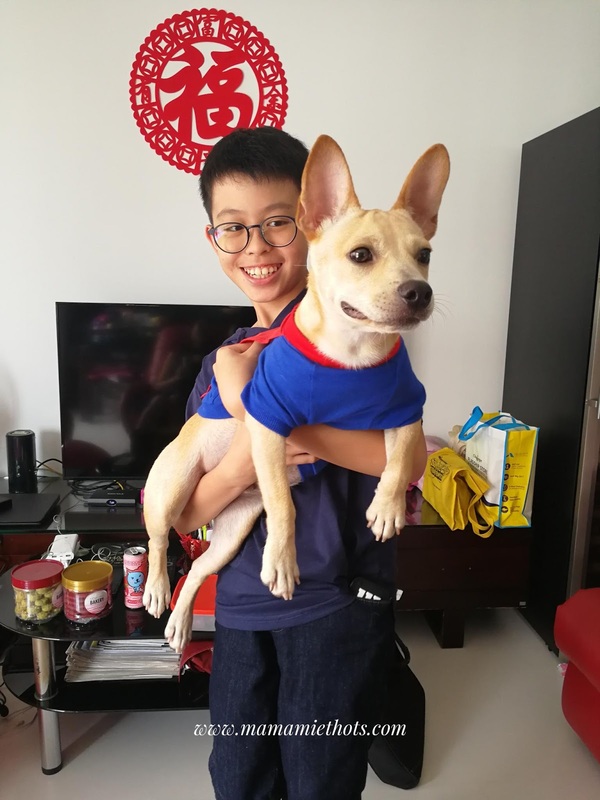 We are quite pleased with his recent CA1 test results. The eldest has chosen to join the Scouts as his CCA and this picture was taken during the Scouts Investiture Day! Although I have stopped their art enrichment many years ago but was very happy to see his drawing skill has not deteriorated much anyway. 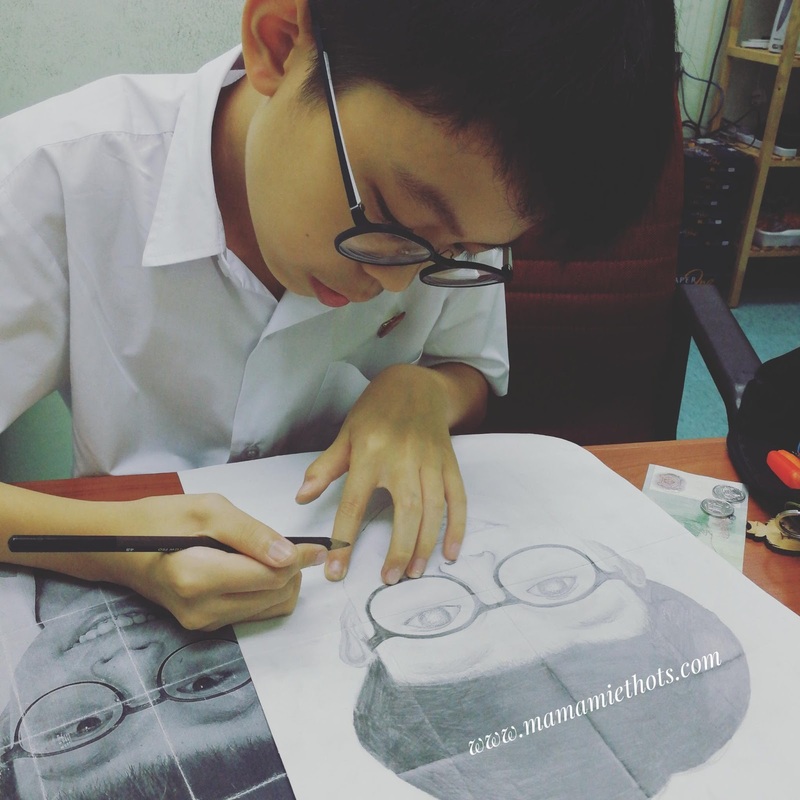 He was trying to finish up his school's graded art assignment by drawing a self-portrait. The boy was surprised to be chosen for the annual inter-house competitive cross-country run. He wanted to train up his stamina by running at the nearby park. 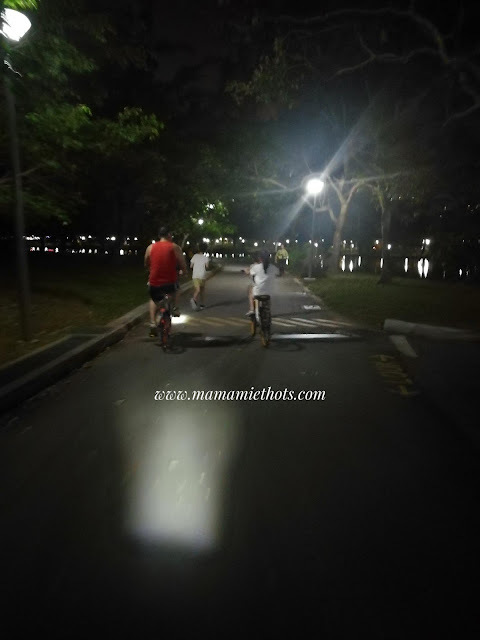 We showed our moral support by cycling along with him. 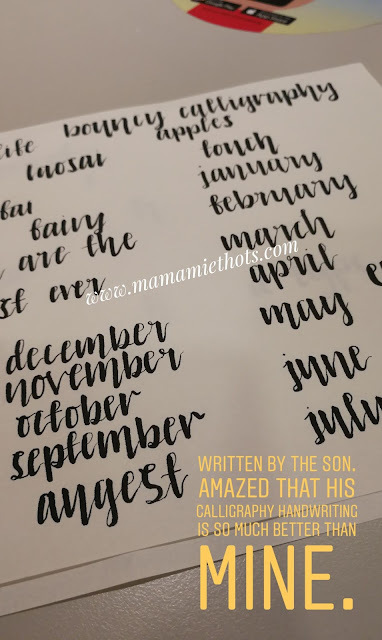 Discovered the boy has another hidden talent in modern calligraphy. This year, none of the kids is taking PSLE so I can relax a little bit. 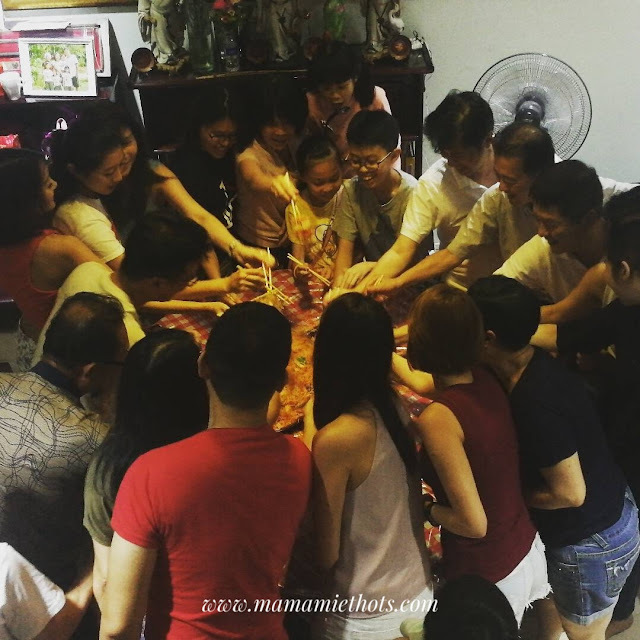 Personally, I felt this is the crucial year for the daughter to build up the foundation on weaker subjects so that next year will be slightly less stressful for her. I just hope she will understand my reason for sending her to coaching lessons this year (coz this girl has no tuition in the past). Recently, she has been involved in too many school activities such as selection interviews and camps. I hope she doesn't overwhelm herself with too many stuff so that she can spend more time on her studies. 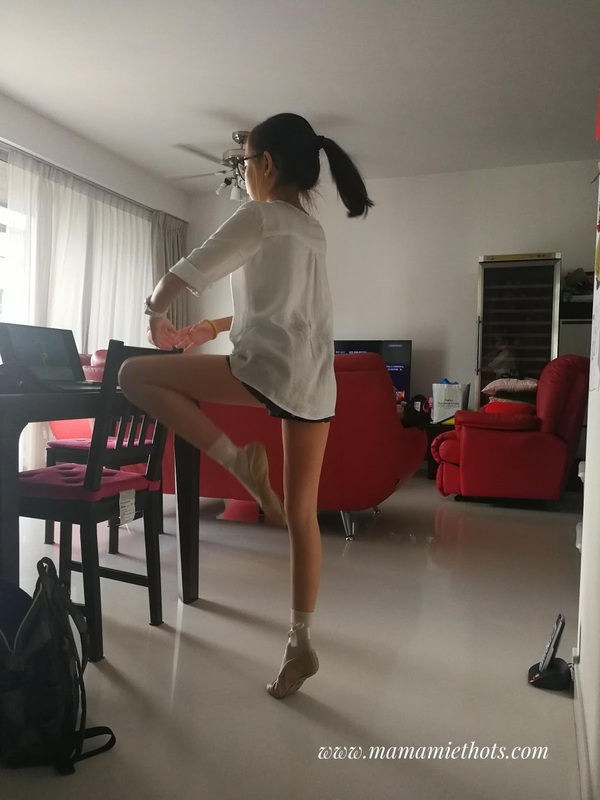 Practised ballet on her own at home because there was no ballet lesson for 6 weeks and the upcoming ballet exam is in April. I just hope she can continue ballet for as long as possible (hopefully till Grade 8) although I know sometimes kid's interest will change as they grow up. The daughter went for 3D2N Chinese Cultural Camp in school. 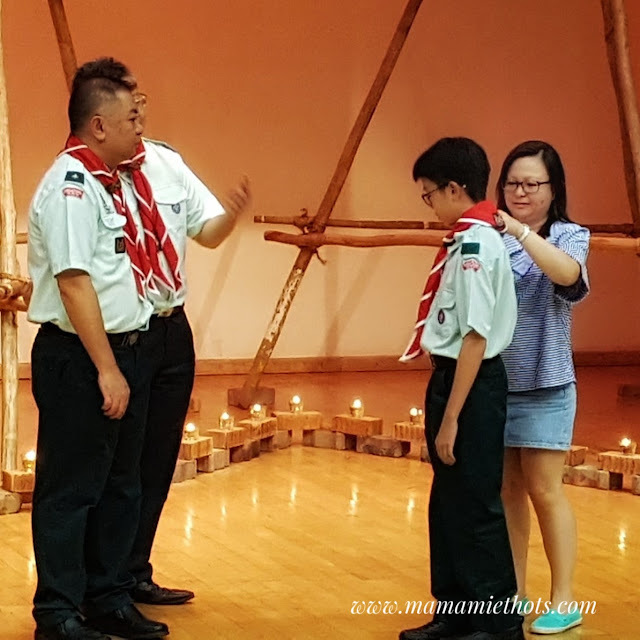 One of the highlights they learnt in this camp is about filial piety. 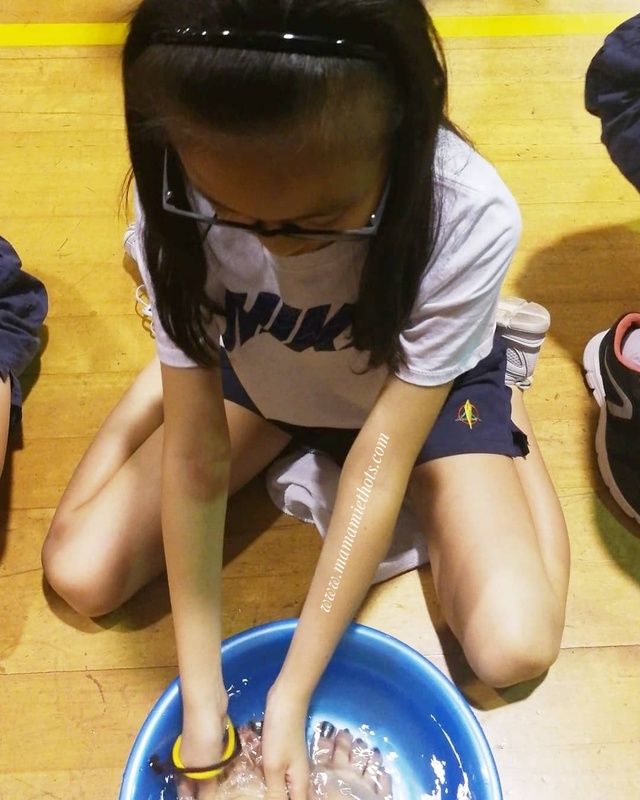 Parents were invited to watch their skit performances and students were tasked to wash their parents' feet to show their filial piety. 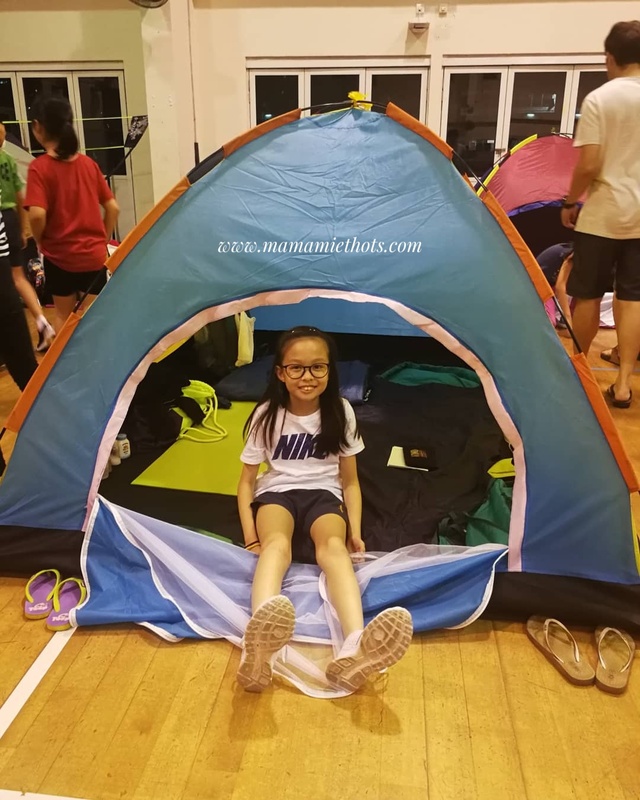 She enjoyed the camp and is looking forward to a longer cultural exchange program overseas during the June holiday break. I remembered the first time I brought Junior YS to this playground. He could not climb any higher due to his fear of height. 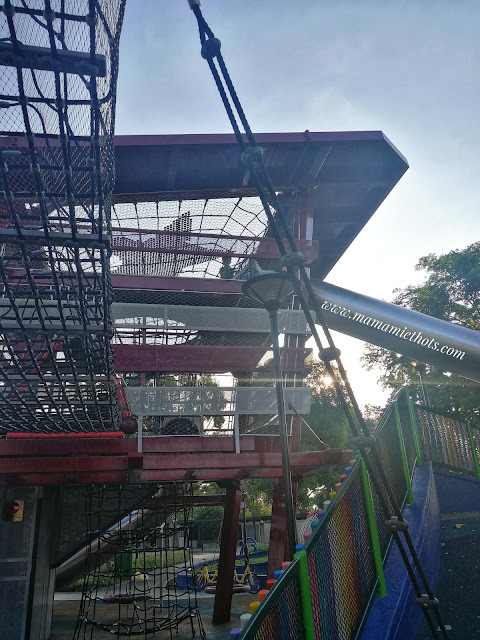 After I brought him there a couple of times, he has finally conquered his fear and is able to climb to the top of the structure by himself. That sums up our 1st quarter of 2018!